It was a cloudy day and at 18 degrees, a little more comfortable than last week’s swelter. We parked in the lower parking lot for Earl Bales Park off of Finch. Climbing the hill to the west of the parking lot brings you to John Bales homestead. John Bales came to Canada from Yorkshire, England in 1819. He bought the lot at the south west corner of what is now Bathurst and Shepperd (Lot 15 1-W). In 1822 he built a log house which was later covered with a combination of cement and pebbles. A kitchen wing was added around 1850 when the family reached 10 children. 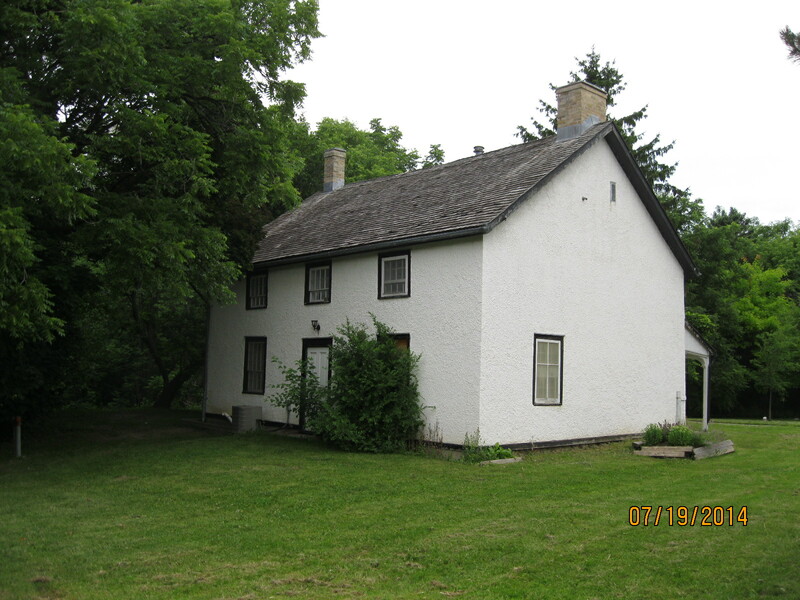 The house still stands and is listed as the 8th oldest house in Toronto. The picture below shows John’s storey and a half house. The term storey and an half refers to the upper floor which was tucked under the roof so you could only stand up in the middle. Log houses reveal themselves by the fact that no upstairs windows cut the roof line of the house. There are four logs that run around the upper rim of the house, where the lower edge of the roof rests, that tie the structure together and cannot be cut through for windows. In the cover picture of the house you can see that windows cut the roof line on the kitchen wing which was therefore not built from logs. In the same picture the older wing has yellow brick chimneys and the newer one has red bricks. Early wells in Ontario were dug by hand and had to be large enough to allow a man to swing a pick axe. They were dug in depths up to 30 meters or more. Early wells had a hand crank which wound or unwound a rope that lowered a bucket into the well. The invention of hand pumps allowed for easier access to water but were limited in the depth of their draw to about 15 meters. 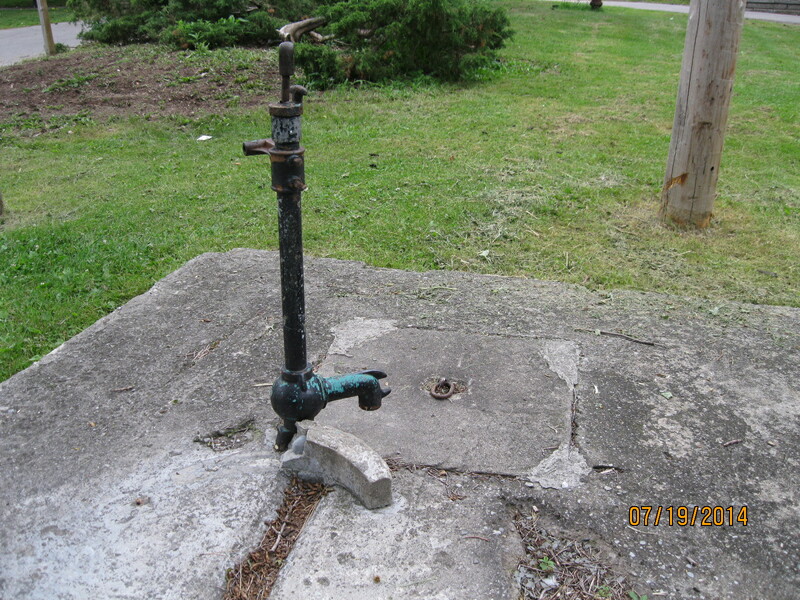 The old well and pump still exists at the front of the house. 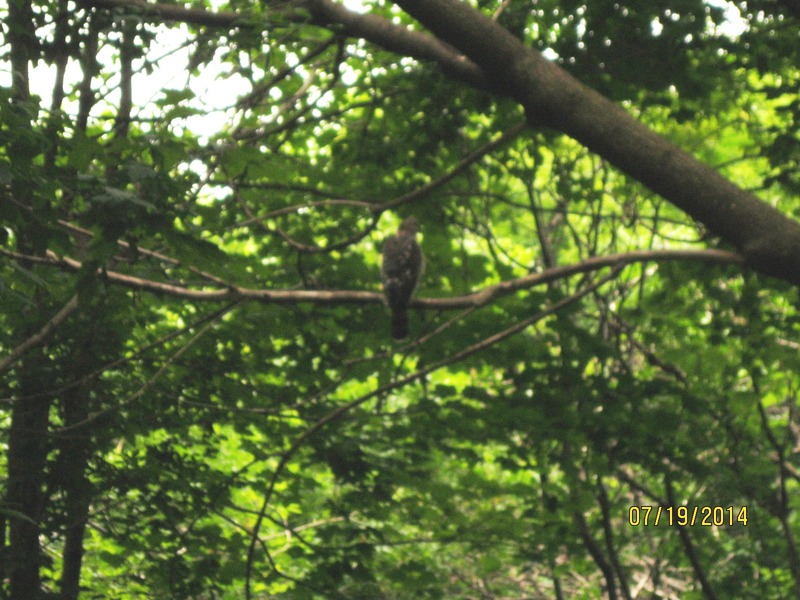 In the woods just behind the old Bales house we disturbed a rookery of American Kestrels. Kestrels are members of the falcon family and are often confused with hawks, to which they are not related. There were at least four of them in this small area of trees. The park sits on land that used to be The York Downs Golf and Country Club and the land forms still show. Just south of the house is a memorial to the Holocaust. 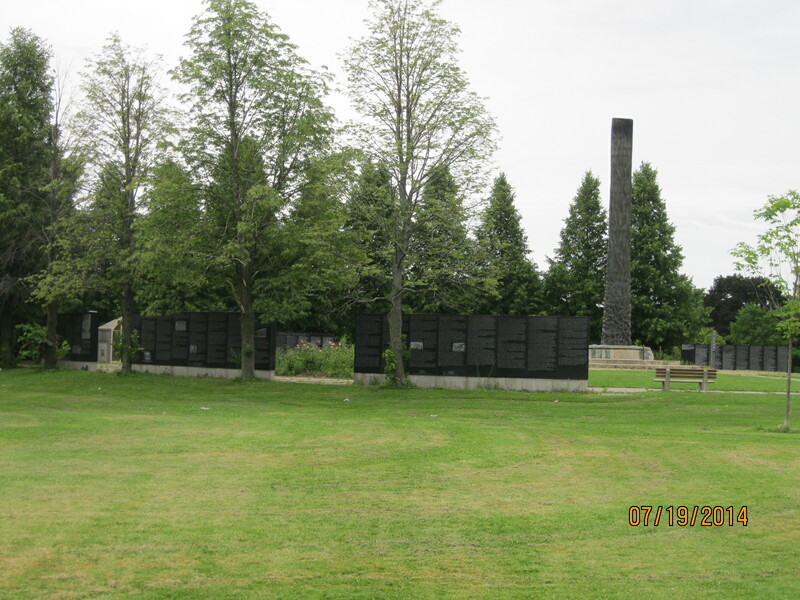 The memorial includes a chimney on the right which has the names of various death camps on it. The black wall to the left of that contains the story of the holocaust on one side and 23 panels of names of victims and their country on the other. This is certainly the most somber place we’ve come across while hiking. We went back down the hill towards the river. There is an area where some stuff has been thrown down the hill. Amongst it we found this old guitar. It was sold by Eglinton Music Centre which still exists today. It made me think of a song by Jethro Tull called Songs From The Wood. We walked back past the car and crossed the 1962 bridge to get to the path that leads down the east side. 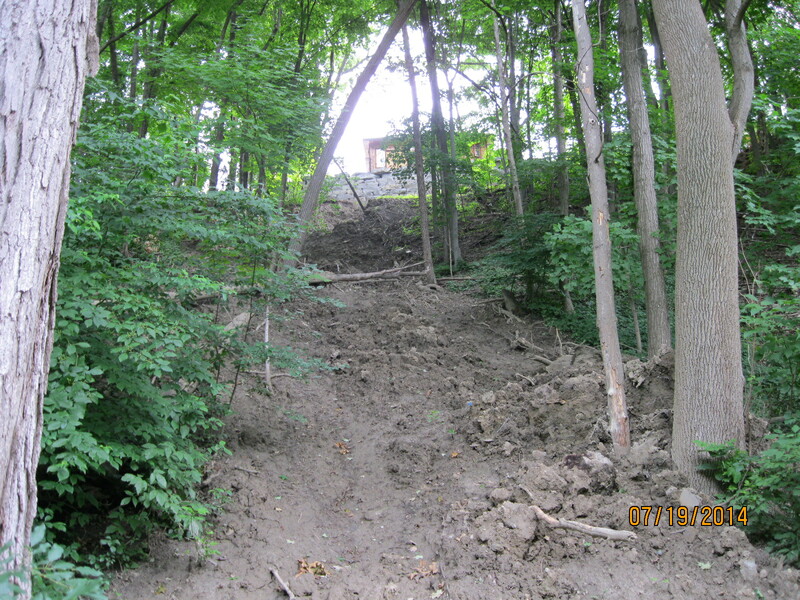 We took a few minutes to have a look just north of the 401 and here we found a place where a large mudslide has ripped away part of the hill. In all my years of hiking this is the first time I have seen this. An area without larger trees at the bottom of the hill suggests the need for investigation. The foundations of a building lie here. 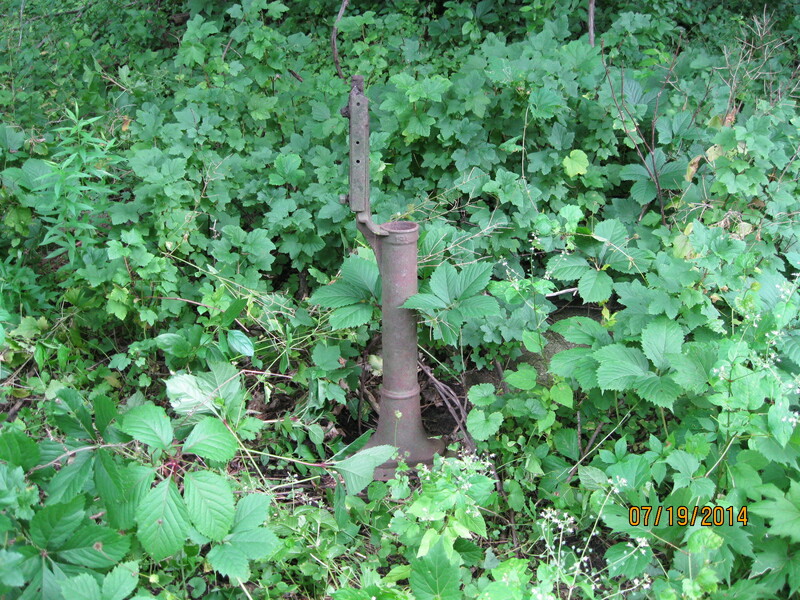 Another hand pump was found inside the foundation. 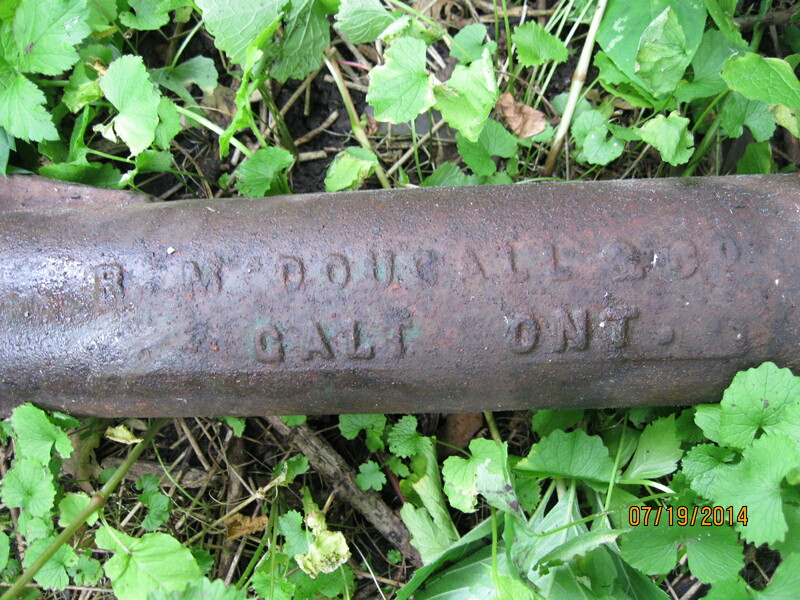 R. McDougall & Co. in Galt was a manufacturer of heavy steel equipment from the late 1880’s until they were bought out in 1951. They specialized in lathes, but apparently also made water pumps. 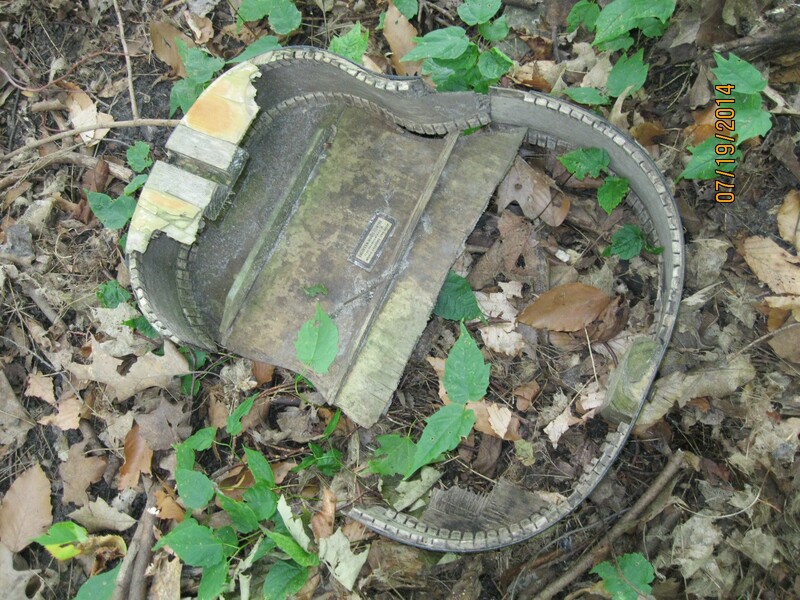 The one we found here was dated 1921. Most of the things we find along our journey were designed to last, and so they have. Today, especially in computer technology, we have something called planned obsolescence. When a new computer is released to the market the manufacturer is already working on a newer version which replace the older one. From massive card operated machines in the 1950’s to hand held computers, that we call phones for some reason, the change has been swift. When Apple released it’s iMac G3 computer in 1998 it eliminated all floppy drives and introduced the USB drive which has pretty much made all other external media connections obsolete. Even as this new technology was being introduced, the vision was already set for cloud-based file storage. The unit pictured below is a G4 released in early 1999. If you walk through the woods on a regular basis you start to see that although plants come and go, there is always something edible in season. From Leeks and Fiddle Heads in the early spring through to Puff Balls in late fall it’s a changing menu. This week the Black Raspberries are just getting going, but it looks like a good crop this year (and tasty too!). 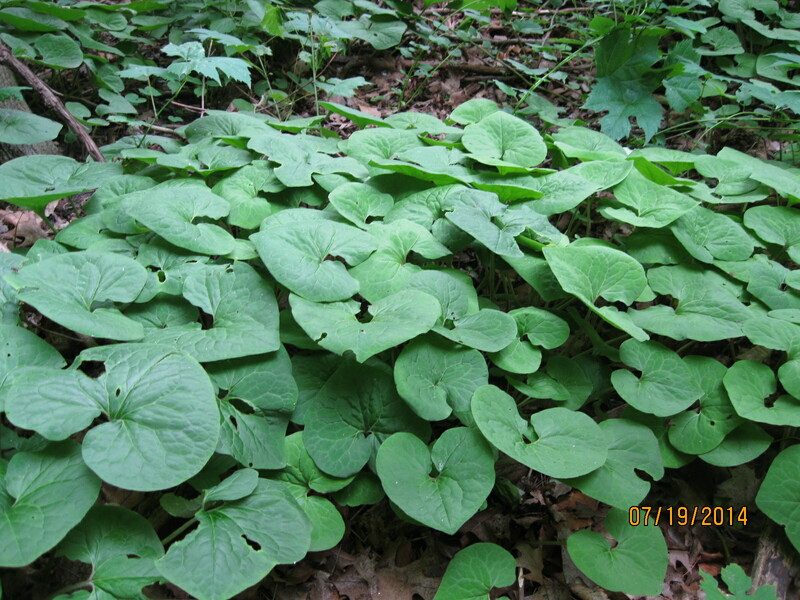 Wild Ginger, pictured below is also in season now. 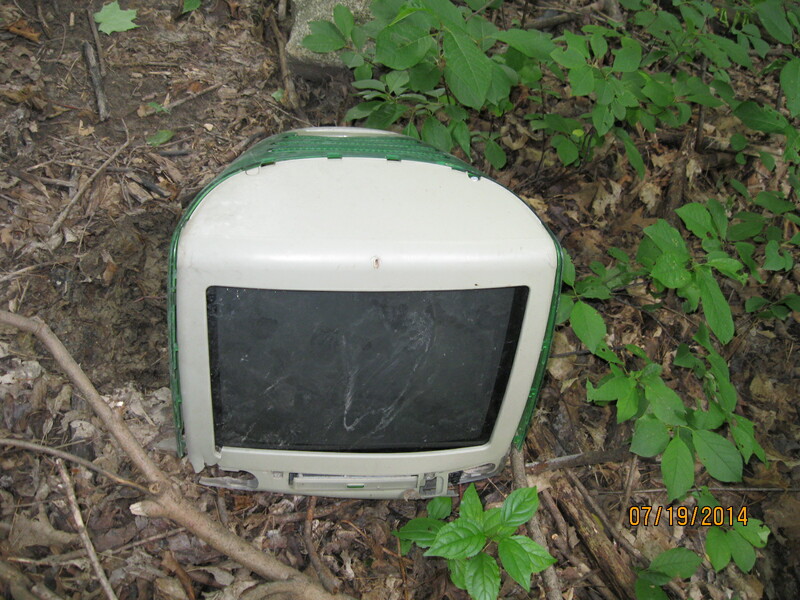 This entry was posted in Don River, Hiking GTA and tagged Don River, GTA, Hiking, iMac G3, John Bales House, r McDougall Galt Ontario on July 20, 2014 by hikingthegta. I absolutely love this website and can’t wait to explore this area! I love local history to understand how Toronto and surrounding areas evolved! I have complete respect for our hostory! Thanks for sharing! Always an informative read. Thanks. Enjoyed your blog! I was walking in Earl Bales today and started my walk through the valley at a parking lot below the dog run area off of Sheppard Ave. As you start heading south and look to the right there is now a large hill covered by bushes and trees beside the paved road, which was once a great toboggan run called, “killer hill”. We used to use it during the winter when it was still the York Downs Golf Course. There were many bones broken going down that hill! Then North York took it over and planted trees across it so the kids couldn’t use it anymore. You continue along the paved path to where there was once a sewage plant (now a reservoir for flood control) at the bottom of Westgate (which was called Ratland in my day). To the left is the Don Valley Golf Course. Good memories.